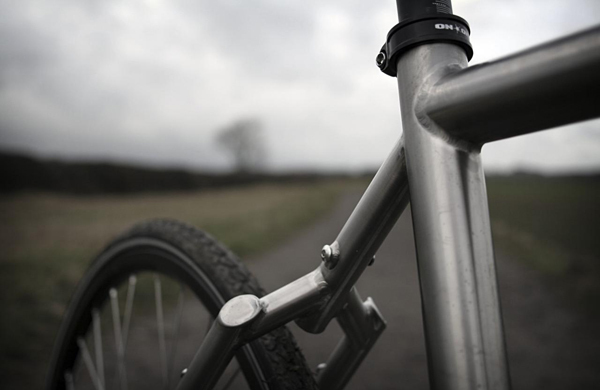 Built from premium titanium selected for its durability and superior ride quality, this frame is more than happy built up in a wealth of different configurations. Designed to take you as far as you want to go with utility and versatility in mind. Build it with flat or drop bars, cantis, discs, V-brakes, a rack, hub gears… Whatever! Sign up for the On-One email newsletter at the bottom of the page to get the latest pricing and availability straight to your inbox. Any update or is the idea now officially dead? It's been a couple of years now. 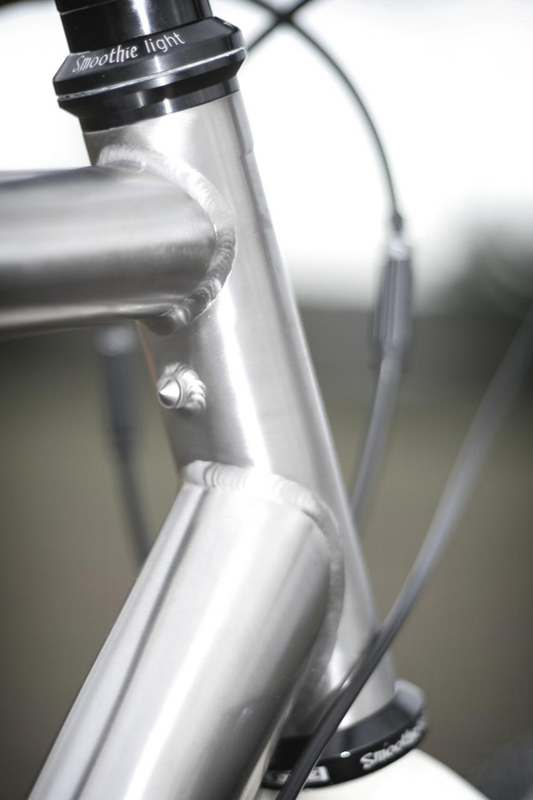 What about news concerning a titanium tourer ? I know people are really hassling you about this frame, but this would be a real block buster !!! 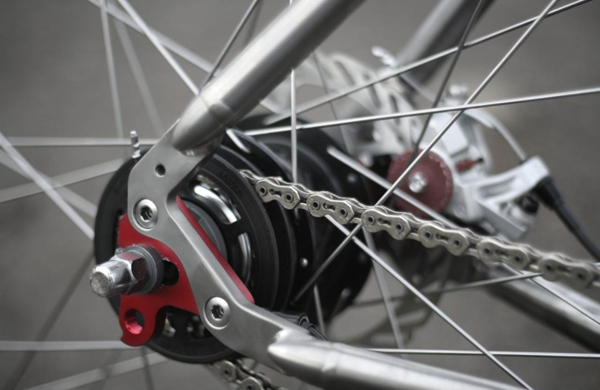 We all want titanium and disc brakes ! Hi John. Sorry to say that the Ti Pompetamine, at this guise at least, has been axed for the time being, though we are working on an all new titanium tourer design. It's a fair way off yet though. Interest noted, David. This bike is still in development... more news when we have it! Hi Frere, these are due to go into production with an expected arrival date of mid October. I'll keep you posted. Hi Mike, we're awaiting a new sample after we made a few tweaks. We wan't to be able to run both Alfine and standard gears on this frame, and while the Alfine worked a treat (as you can see from Ian's video above) we had a couple of minor issues running gears. These things take time, particularly as we really want this frame to be absolutely perfect before release. Hi, is there any news about it? When will it be available for purchase? Hi John, pricing hasn't been finalised as yet. Any idea about a price for the moment ? Will it be for sale under 1000€ ? Hi Jon On-One, Is there an update timing and the fork? Make it! I'm currently drawing up my own ti frame to have it built in China. This would save me a lot of hassle. Maybe make it beltable? That would make it even better. Make it! Sweet! Looking forward to more details. I think you have just shown me my perfect frame - seriously, I've spent hours on Google looking for this and the closest I've come is the Amazon, but those outboard disc mounts make fitting a rack tricky. Just keep the versatility there - it needs to retain as many options as possible because this frame is going to last a really long time. 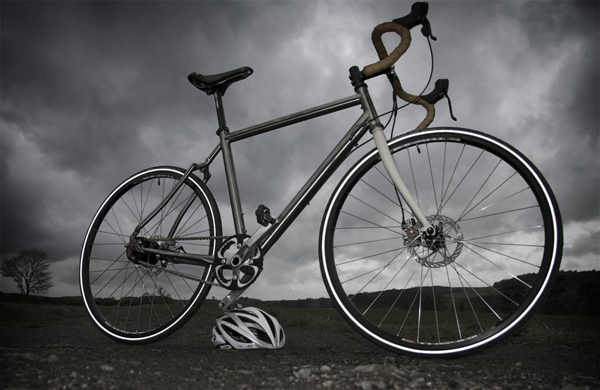 So: swapouts, rack mounts, guard mounts, pump peg, v's, discs, tyre clearance... Don't forget those mudguards - you haven't mentioned them in the description! Ive just gone over the Ti Van Nicholas frames. And this frame here seems to be shaping up to be a much better option for SS or IGH (provided its not too pricy). I hope yous will have plenty of tyre clearance (I think it will if yous are speccing it close to pompetamine frame geometry as stated in an earlier post) and a disc compatible fork. Im hoping the fork will have a calipar brake hole so I can use it to mount a dynamo light. My guess is yous won't. But I hope you's do :) Im also guessing yous will spec it with a carbon fork. Time will tell. Its looking good so far though. And I think it will look even better with a titanium seat post. If not, then my black Thompson Master piece and black X4 stem will fit on it nicely, along with some black Mavic 29er wheels laced with black Sapim CX Ray spokes to a Chris King rear SS hub and a Schmidt son deluxe dynamo front hub thanks. The imagination is running wild. I think ive said enough. This looks really great, very excited about bikes like this with the 11 speed. As with the Pompetamine, nu-Scandal & nu-Inbred, I'm really belt-curious and if there is a simple way to allow a belt in there I'd be made up. Must have. Will look lovely next to my Ti456 :0) just hopefully it will be out by the summer when I am going to do the Fred Whitton route, just a shame it won't be out for spring for my 2 week Scotland tour! I was going to write a comment, then read Nick Bown's, which said exactly what I wanted to. So, please spec with a disc fork with rack low-rider mounts AND mudguard mounts. Also hassle Versa to bring out the 11 speed brifters asap. Thanks! Is that a pump peg on the head tube - that has to stay - no pump peg no sale !! Seriously I am liking that a lot - sick of fettling derailleurs on my winter hack - that on-one for winter/touring/knocking about on with the kids plus a summer race bike - job done. Now that looks gorgeous... looks like I'll be chucking my pomp Alfine 11 kit onto that frame later in the summer!!... Haven't got my Pomp yet and I'm already planning on pulling it to bits!! Hi there. Production of these bikes is at least 4 months off, which makes a workable eta of mid-Summer. Geometry is similar to our Pompetamine. Forks are yet to be confirmed. Assuming the geometry is sensible I'll have one too. Which fork will it have in production? A dream come true? If the frame has room for 1,7" rubber, is strong enough for racks and panniers, has longer TT than Pomp and will be availiable in the end of May/june (bitte bitte!). Sweet, hope it's not too far into the future, and that the price is right! Can you make it with enough clearance for 29er tyres and I'll buy one. There is demand for a bike like this, it would take sales away from the salsa fargo and others like it. My kona sutra is getting towards needing replacement and this would be a worthy successor.